Words often used to describe 1950's prom dresses are romantic, glamorous, and innocent. Just like the era when these dresses came into vogue, the 50's prom dress has become a timeless icon. Proms became very popular during the 1950's, as did these dresses, which are still being worn today. The 1950's were a time of great change in the fashion industry. New fabrics had been invented from petrochemicals and soon became affordable. Teens were staying with their families longer before marrying and entering the workforce. This created a new market for clothing and products geared towards adolescents. Teenager's tastes were often influenced by the movies they saw and the music they listened to. Teenagers' desire to be glamorous like the Hollywood icons that they admired led to the creation of the beautiful prom dresses of the 1950's. These dresses were often adorned with sequins, rhinestones, lace, and embroidered appliqués. The dresses were made from fabrics such as organza, taffeta, tulle, and satin. The colors of 50's prom dresses are also unique. Turquoise and tangerine are not often seen in prom dresses from other eras. The body of the dress is usually fitted and the skirt is usually large and "poofy". This classic look is feminine, innocent, and glamorous. 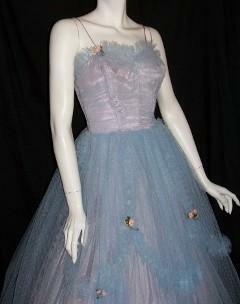 One of the trademarks of classic 1950's prom dresses was the round, fluffy, tea length skirt. Volume was added to the skirt by wearing nylon or paper net petticoats under the dress for support. Several layers of petticoats were worn to get just the right amount of "poofiness". The petticoats were made sturdier by applying starch. Nylon horsehair braid was also sewn into the hem of the skirt to help it flare out gracefully from the waist of the dress. These methods are still in use today for bridal gowns and vintage dresses. In the 50's, women paid very close attention to even the smallest detail. Handbags matched shoes, nail polish and lipstick were the same color, every hair was in place and frequently adorned by a jeweled clip or headband. Gloves added a touch of glamour to many evening dresses. Pearls were often used as the classic finishing touch to a classic gown. All of these little touches helped to showcase a beautiful prom dress. This attention to detail was present in everyday looks as well as special occasion. Many prom dresses from the 1950's remain timeless, and are still being worn today. Keeping a vintage gown or two in your closet will assure you of having something unique and beautiful to wear to prom or any special occasion. 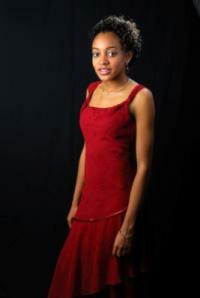 There are several designers whose prom dresses remain popular and are available online and in vintage clothing stores. Emma Domb- From 1939 until the 1970's Emma Domb and her sister Lorretta Domb Steinberg created stunning wedding gowns, party dresses, and fancy date ensembles. They were based in San Francisco, CA. For more cute dress ideas... watch this slideshow! Christian Dior-Considered a master of creating shapes and silhouettes, Dior was credited with inventing "The New Look" in the 1950's by Carmel Snow of Harper's Bazaar. Mainbocher-Main R. Bocher was the only American to run a couture house in Paris. He also refined the beaded and embroidered cashmere sweater for evening wear. You can find vintage prom dresses in many places. Try your grandma's attic first. Local thrift stores sometimes have these taffeta treasures hanging on a rack just waiting for someone to recognize them. You may want to take a look at eBay also. There are many other great online resources for vintage prom dresses and accessories. Lulu's Vintage Blog has an amazing list of dresses, accessories, with photos and places to you can buy these items. Unique Vintage carries many vintage and vintage inspired dresses and accessories. Dorthea's Closet has a variety of great vintage clothing items and accessories. Pinupgirl Clothing offers everything from lipstick to shoes for that head to toe retro look you want to achieve.